PARIS ? Thehead of Russia?s Roscosmos space agency on Dec. 7 said all launches oftheProton vehicle will be suspended until a board of inquiry hasdetermined thecause of the Dec.5 Proton failure, which destroyed threeGlonassnavigation satellites. Instatements posted on the Roscosmos website following an interview withRussia?sIzvestia news service, Anatoli N. Perminov also said a demonstrationmodel ofthe next generation of Glonass satellites will be put into operationalserviceto offset the lossof the three Glonass-M spacecraft. The launchof the first next-generation Glonass-K satellite, now undergoing finaltestingby manufacturer ISS Reshetnev in Krasnoyarsk, Russia, is scheduledlater thismonth aboard a Soyuz rocket. Perminovsaid he hopes the inquiryboard will return its conclusions by the end of this month,and perhapseven within two weeks. ?Until wereach conclusions about the causeof the failure, Proton won?t be launched,? Perminov said. ?Wehave one morelaunch of this rocket, with a foreign payload, on this year?sschedule.? AnInternational Launch Services (ILS) Proton using a different upperstage thanthe one used for the failed Glonass launch is scheduled to launch theKa-Satconsumer broadband satellite for Eutelsat of Paris late this month. InternationalLaunch Services on Dec. 7 released the following statement about itsKa-Satlaunch preparations. "Weexpect to receive an interim [Proton failure] report in approximatelyone weekthat may include details on the respective performance of the BlockDM-03 upperstage built and operated by RSC Energia and the three lower Proton Mstages,all built and operated by Khrunichev Research and State ProductionCenter, themajority owner of ILS. While the Proton M is a flight-provenconfiguration,this was a maiden flight of the Block DM-03 upper stage, which is aderivativeof Energia?s Block DM-3. "TheKa-Sat satellite built by Astrium for Eutelsat is scheduled for launchonDecember 20 using the Proton M Breeze M launch vehicle. The Breeze Mupperstage, like the Proton M stages, is built and operated by Khrunichev.TheKa-Sat satellite launch campaign continued with the completion of thespacecraft propellant loading yesterday, and the start of jointoperationstoday with mating to the payload adapter system. "Furtherinformation will be provided on the status of the December 5 Proton MBlockDM-03 GLONASS-M mission investigation as well as the upcoming ILSProton Ka-Satlaunch as soon as it becomes available," the statement concludes. 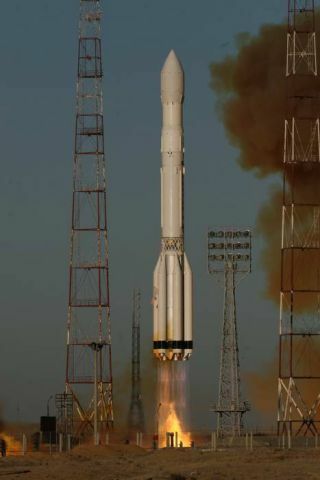 Perminovsaid the Proton rocket, which for ILS launches uses the Breeze M upperstageand for some government launches uses the older Block DM stage, remainsone ofthe world?smostreliable vehicles, with a 96 percent success rating. He notedthat the Breeze M caused a Proton launch failure in 2008, and that theBlock DMstage ?has not had any problems ? for almost 15 years. Proton DM haslaunched sixGlonass satellites in 2010, and the injection accuracy wasvery high.? Perminovsaid the Dec. 5 launch used a Block DM with a newly modified, digitalcontrolsystem, and that this could be one focus of the board of inquiry. Buthecautioned it was too soon to point to any single cause. After amajor government investment to return the Glonass constellation to fullserviceover Russian territory, and then to a global utility on par with theU.S. GPSnavigation and timing constellation, the Glonass system now counts 20operational satellites and two in-orbit spares, Perminov said. Whileonly 18operational satellites are needed for full Russian coverage, it takes24 toprovide a global service. With aGlonass-K satellite launching aboard a Soyuz vehicle with a Fregatupper stagefrom northern Russia?s Plesetsk spaceport in the coming weeks, and theintegration of the two in-orbit spares, the constellation will have 23operational spacecraft. ISS Reshtnevis completing another Glonass satellite, presumably a Glonass-Kversion, thatPerminov said would be ready for launch in three or four months. Thepossibility of accelerating production of other Glonass satellites isunderstudy, he said.